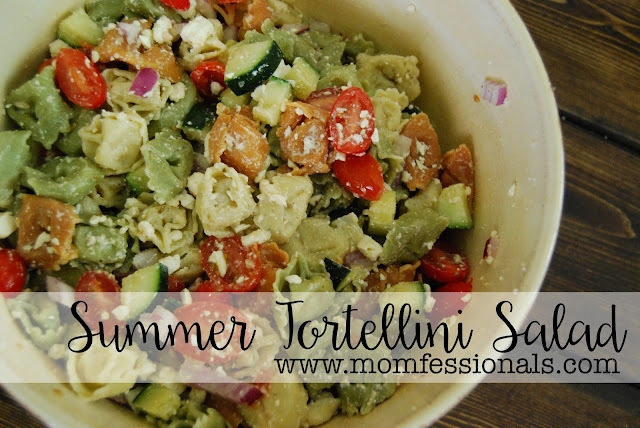 I love a great pasta salad in the summer... something that I can prep on the weekend and eat for a quick lunch by the pool or for dinner as a side with something off the grill. I came across this recipe back in the Fall and last week was the perfect time to try it out. (the original recipe called for olives as well, but I left those out since they're not my favorite). Bring a large pot of salted water to a boil. 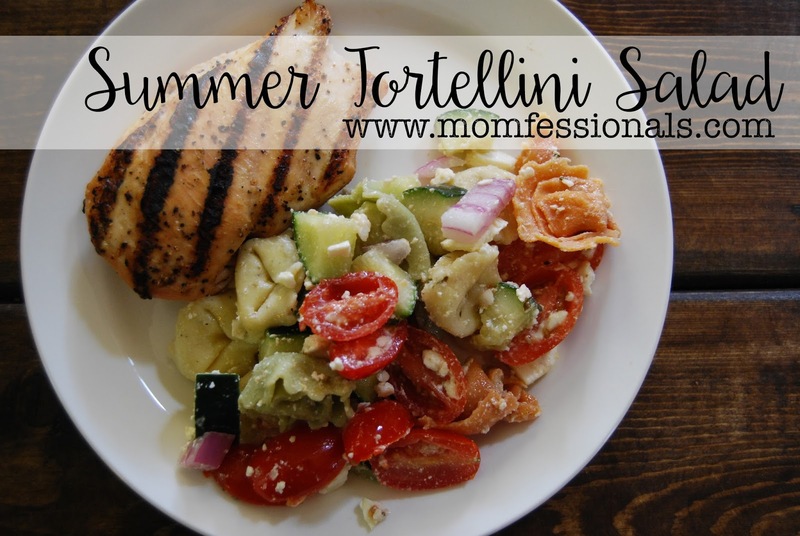 Cook the tortellini according to the package directions and then drain and rinse them with cold water. I grabbed these tortellini from our local Kroger store and they were SO GOOD!!! I hadn't tried them before, but will definitely use them again. Slice the tomatoes in half, dice the cucumber and chop the onion. Whisk together the olive oil, vinegar, garlic, oregano, salt and pepper together in a bowl. 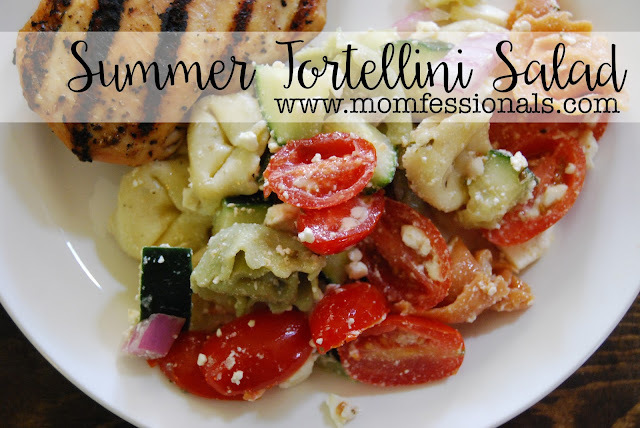 Toss the vegetables and Feta cheese with the cooked tortellini. Pour the dressing over the salad and mix it together until it's all coated. 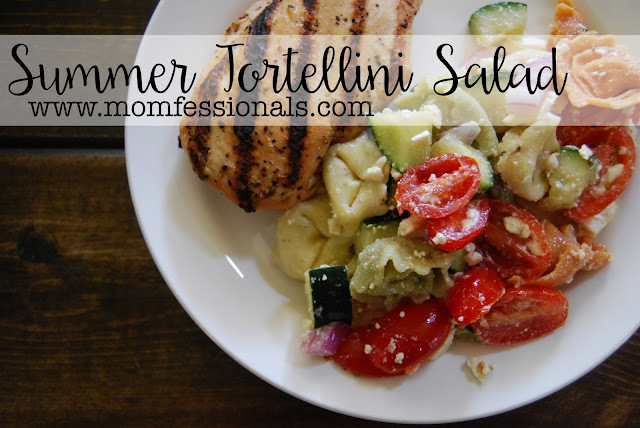 I'd love to try out any great summer salad recipes that y'all have - so leave them in the comments or send them to me! (dave-and-andrea@hotmail.com). Hi! love your salt and pepper holder! do you remember where you got it? That looks so yummy. I need to try it! You should join our recipe club link up today! This looks delicious! :) What type of camera do you use? This looks amazing Andrea! Thanks for sharing! I am definitely making this soon. Yummy! I love a great pasta salad! 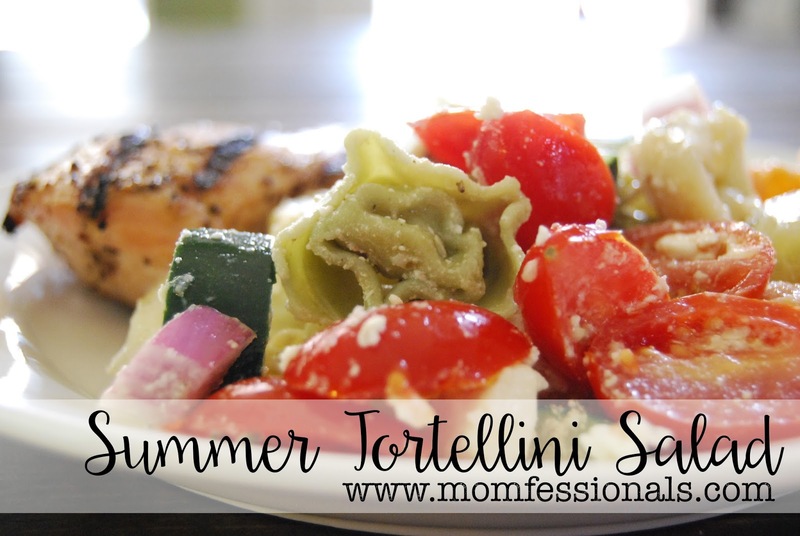 Perfect to leave in the fridge and snack on all week long! I found a great one from Mel @ The Larson Lingo. I make it on a Monday and nibble all week. Yummy! Looks delicious! Totally making it this weekend when we have company! This looks soooo good!!! Heather from My Glittery Heart and I started a recipe club today =) You should link up with this recipe! Here's a favorite in our house. Even our picky son likes it. I usually roast the caramelized pecans in the oven for a few minutes to add extra crunch. Yummy! I think I'll add some shredded rotisserie chicken and call it dinner! This probably doesn't need a recipe but I LOVE homemade mango salsa during the summer. We have cilantro in our garden and nothing beats fresh cilantro. I dice 3-4 heirloom tomatoes, 1 ripe mango, 1/4 red onion with chopped cilantro, lime juice, salt and a seeded jalapeno for spice. Sometimes I will throw a diced avocado in there if I'm feeling fancy. Then I use blue corn tortilla chips for dipping. Other times I use a white peach instead of a mango. Made this today for a family BBQ and it was delicious. I kept in the olives and used mozzarella cheese balls cut in half. So good! Just made this for our weekend up at the lake, and it was so good! I got so many compliments! I opted to add kalamata olives. Yummy!